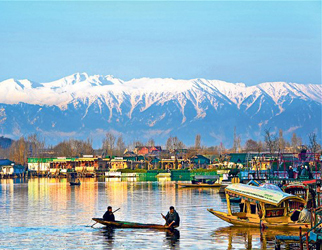 Start off your Srinagar tour by arriving at Srinagar Airport where our representative will meet you and transfer you to the Hotel. After that visit famous Mughal gardens like Nishat Garden, Shalimar Garden, Chashma Shahi, Pari Mahal/ Shakar Acharya Temple. In the evening go for a Shikara Ride(at your own) on the famous Dal lake. Evening free of leisure. Overnight stay in Hotel..
Today after breakfast proceed from Srinagar to Sonmarg (90 Kms) also known as "THE MEADOW OF GOLD". Take a Pony ride out here and enjoy the White Mountains covered with snow and the River Sindh flowing through the valley. Evening return back to Srinagar. Dinner and overnight stay in the hotel at Srinagar, . After breakfast, transfer to Gulmarg. On arrival, enjoy natural beautiful surroundings and enjoy pony rides (on your own). After relax, enjoy Gondola rides (on your own payment). Gulmarg ropeways have two phases namely Gulmarg to Kungdoor (Phase I) Kungdoor to Affarwatt (Phase II) Gulmarg Golf Club is in existence for 100 years. In the evening back to Hotel for a comfortable overnight stay in Srinagar Hotel. After breakfast, check out from the hotel and transfer to Pahalgam from Srinagar (95 Kms) while en route enjoy Saffron garden & Apple garden. On arrival, check in to Hotel. After relax, enjoy famous natural surroundings and visit Chandanwadi, Aru, Betaab Valley (on your own payment). In the evening back to Hotel for a comfortable overnight stay in Pahalgam Hotel. After breakfast, Check out from the Pahalgam hotel and transfer to Srinagar. 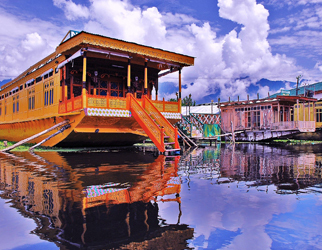 On arrival in Srinagar Check into at houseboat .Dinner and Overnight stay in Houseboat. .
After breakfast, transfer to Srinagar Airport with memorable experience of Bharat Booking Holidays............, .